One of the promises of my book is that I do not call for obscure or expensive ingredients. After all, French women don’t chase around the internet for their cooking, why should you? So you might raise an eyebrow at the Pernod called for in this recipe. It can, indeed, be expensive if you buy an entire bottle, but in many markets, you may be able to find an airline-sized bottle for a few dollars. Or, find a small bottle of ouzo (the Greek spirit) or anisette. They’re not exactly the same, but they’ll give you the the mild anise-like flavor that’s a hallmark of this elegant one-dish meal. This recipe is perfect for a cozy dinner for two; and while it looks and tastes like something you’d pay top dollar for at a corner bistro, it comes together very easily. 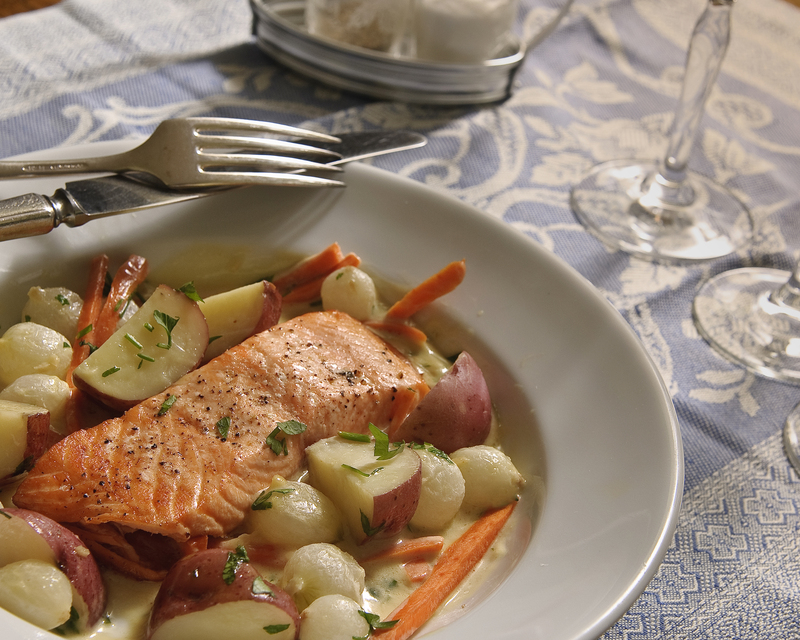 Just get the vegetables and sauce going before you start roasting the salmon, and you can likely have this dish on the table in half an hour. 2. Put the potatoes in a medium-size saucepan with enough lightly salted water to cover by an inch. Bring to a boil, then cook at an active simmer for 10 minutes. Add the carrot and onions and cook until all of the vegetables are just tender, about 5 minutes more. Drain and rinse with cool water to stop the cooking process. Drain well. 3. Meanwhile, melt the butter in a small saucepan over medium heat; add the garlic and cook, stirring, until fragrant, about 30 seconds. Remove the pan from the heat. Add the white wine, clam juice, and 2 tablespoons of the Pernod. Bring to a boil and boil until the mixture is reduced to about 2 tablespoons, about 7 minutes. Remove from the heat and set aside. 4. While the vegetables are cooking and the sauce is reducing, measure the thickness of the salmon and season with salt and pepper. Combine the olive oil, the remaining 1 teaspoon Pernod, and the fines herbes; rub the mixture all over the salmon. Place in a shallow baking dish, tucking under any thin edges so that the fillets are as uniform in thickness as possible. Roast until the fish flakes easily but is still glistening in the center, 4 to 6 minutes per 1/2 inch of thickness. 5. When the fish is just about done, reheat the sauce. Stir in the cream and bring to a boil. Add the vegetables. Cook, gently tossing, until the vegetables are warm. 6. Spoon the vegetables and sauce into two warmed shallow bowls, arranging the vegetables toward the rim. Place the salmon in the center of the bowl. Sprinkle with fines herbes and serve. Perfect Timing – Next Friday evening I am hosting our Annual Girls Night Out Holiday Party. Friends bring appetizers and dessert and I provide dinner and the wine (including Beaujolais cru not Nouveau hoping to find Fleurie). Was planning to make a Fish, Pasta and another meat dish. This recipe looks very good. A bit concerned about the licorice / star anise flavor of the Pernod. Never used this flavoring in a recipe before and am concerned it may be too strong. Also which herbs do you recommend ? Would a teaspoon of Herbes De Provence work? Any non-pasta suggestions for holiday dinner for 14 Bonne Femmes ? Boeuf Bourguignon ? Others ? I would definitely not make this for 14 bonnes femmes. It’s really meant for two or a few. And you’re right about the anise flavor–while delicate, it may not be for everyone. But if you do make it, I recommend fines herbes, a blend of tarragon, parsley, chives, and chervil (see the explanation on page 242). 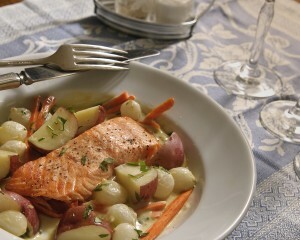 A better alternate for the fish dish would be Tuna Steaks Braised with Tomatoes, Olives, and Fennel (page 208). It will be more forgiving if it has to sit a while while people make it through the buffet. In fact, one of my favorite cooks, Kathy Eckhouse (co-owner of La Quercia Prosciutto) served a dish similar to this for a large party. When the dish was finished, she simply kept it covered on her buffet table until people were ready to eat. It stayed warm in a heavy cast-iron pot (like Le Creuset) without overcooking the sturdy tuna steaks. I think the Beef Bourguignon, Banquette de Porc, and the Choucroute Garni Mardi Soir are all really good choices. And even those who say they don’t like sauerkraut might change their minds when it’s braised in wine and chicken broth. By the way–did you get the signed copies of the books? I sent them the day I got them from Amazon.